We have a lot handmade props creating a unique atmosphere, e.g. 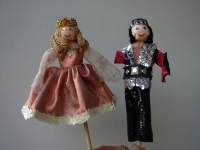 dolls on sticks, clock with seasons of the year or a magic cloud with crystal raindrops. We use also puppets, masks and animals on gloves. 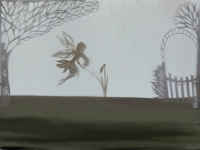 Some stories we present in the form of a shadow theatre. In our repertoire there are also stories that we tap, like for example the story about elephants. W During the performance we are dressed in black. Then instead of the whole disguise, of for example an old woman, it is enough to put a flowery scarf on the head. The rest we act with words and gestures. Because of that, in a short time and relatively easy way we can incorporate a lot of characters. 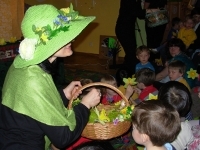 Stage setting is enriched by the works of the artist Teresa Witkowska (www.moyo.pl), among others a big English egg Humpty Dumpty or cut out from paper decorations used in the shadow theatre.